A fantastic sticker book in series with the popular Look and Point Bible (nominated for the Ultimate Christian Library Book Award 2012). 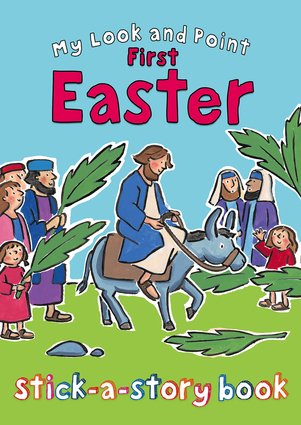 The story of The First Easter is told over five double page spreads with spaces in the story to be filled in, and extra activities at the bottom of the page and at the back of the book. Annabel Hudson's cute, cut-out effect artwork is the perfect style for these Bible story sticker books. Christina Goodings is the pseudonym of an in-house author.After winning a place at Central Saint Martins, Annabel Hudson left her job as a lawyer and studied graphic design and illustration. She has been illustrating children's books ever since.